Windows 10 GUI API C/CPP native Interface Pascal compiler. A functional windowing GUI provides unlimited access to the Windows API with integrated cloud computing interface. FrameworkPascal provides three types of Windows object oriented programming skeleton programs which can be used as model applications: SDI, MDI, and Framework. SDI and MDI (Single and Multiple Document Interface) are standard Windows GUI OWL-compatible programs. Framework programs on the other hand substitute the Windows's messaging systems and the windows themselves with Framework's own managed frames, users interface and API. Frames are true hierarchical object which can be referred to by names, uses as program variables, reflect, managed and display their content and are contextual in comparison to windows which are only a link to a clipped display area on the Windows desktop. Frames interrelate in sets that have no limit on nesting depth and siblings range and are used as the elemental building blocks of the programmable environment accessible through an API and user interface which is Framework. Their persistent positions and order, inherent selection capabilities and contextual characteristics makes the Framework user interface visually independent. Framework programs create their own frames and manages their own memory, mouse, and display but at the same time provide transparent access to the Windows API allowing programmers and users to freely combine Windows and Framework code and modules. Framework include various tools to deal with existing legacy code including a 16 bit real mode emulator which can be programmed to debug, analyze, report binaries as well as redirect specific operations to Windows API functions without compiling original code. OWL compatible units provide efficient migration of Borland Pascal OWL, Turbo Pascal and Object Pascal programs written for DOS and 16 bit Windows 3.x to Windows 32 with minimal changes to code. Code written for other operating systems such as DOS, for text modes as well as full screen graphic modes, can be drooped as is into provided object oriented programming or function based model applications skeletons and compiled into GUI OWL applications. Back compatible graphics functions hides the Windows GUI complexities and transparently adds to legacy code windowing management and graphic scaling. FrameorkPascal object oriented Framework provides abstracted generic system wide functions as well as powerful informative visual and voice interface elements such as a segmented context based status line which can be displayed as part of metaphors such as forms, tables, or even a custom desktop. Elements has corresponding functions and can be can be hidden while used programmatically for contextual interface. FrameworkPascal's Framework API is modular and its elements can be called as needed. It is designed to simultaneously run freely-mixed compiled and interpreted code. Programs can be built using compiled object oriented and function based programming forming a skeleton in executables on which function-based interpreted modules can run. The Framework architecture provide the run time interactive interpreter with equal access to the compiled objects and functions. Interpreted programs can be combined with compiled code or can be constructed on the fly by users or code at run time. The function based interpreter can allocate memory to built its own object based structures as well as duplicate and extend the compiled object oriented skeleton. The interpreter provide keyboard programmatic control with macro recording which in turn allow automation of such built-in tools as graphic scaling, rotations, combining graphics with text and saving of files in popular graphic formats with no programming. The Framework windowing management system for FrameworkPascal is an ideal visual document management and programming platform designed as an alternative to Windows' MDI. Abstracting the complexity of hierarchical windowing management the Framework's architecture and building blocks would have required massive programming effort using Windows or Linux tools as well as large memory and computing resources making them impractical without the Framework technology. Some capabilities such as Framework's window referencing and data indexing which replaces hashing with a big-O of one algorithm requiring minimal CPU resources are unique to Framework. Framework replaces Windows' MDI (Multiple Document Interface) with multiple "desktops" containing user-labeled windows. Container "desktops" and their child windows can be referenced by name programmatically or manually. Desktops may contain any kind of windows and can grow to hold multiple complex documents and programs. All windows regardless of their content have parents and may have siblings and children. Each has a dynamically indexed editable label and an optional associated interpreted program in it's formula area. Most important, without giving up an inch of access to Windows programming resources programmers can literally ignore the Windows event driven API messaging system and focus on their design. Simple to use functions with corresponding menus create windows and set the relations between them. Framework's functions handle keys, mouse input, and focus, and make interface with system and cloud computing resources a breeze. Framework's windows relationship are managed transparently in an architecture complying with network based database methods which minimizes system resources and take advantage of new parallel algorithms. The Framework architecture is currently implemented on Windows as well as a proprietary hardware based operating system. It is available with and without FrameworkPascal for commercial and enterprise development of GUI and cloud computing applications. Based on the Framework technology special GUI cloud computing applets can be used to eliminate the complexity and security vulnerabilities involved in using browsers as cloud computing client side interface. GUI cloud computing applets can be automatically pre-configured for client machines hardware verification for added security. FWPCC was designed specifically and exclusively for compiling Windows GUI client side cloud computing open source programs provided with it. It requires a views.com cloud computing server development account. 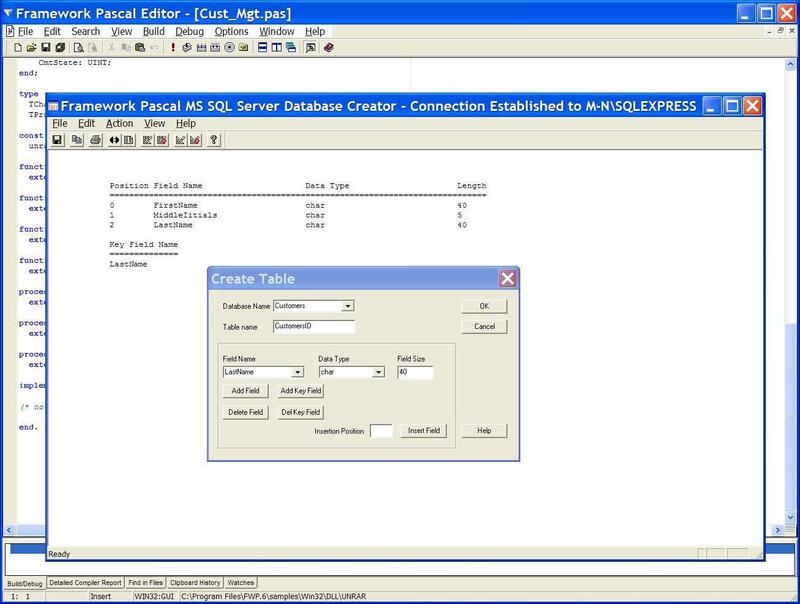 Cloud Computing Applet programs are built on top of a well documeted easy to use interface connecting a Windows GUI editor and a modular SQL server interface. Framework Computers, Inc. preserves the investment companies have made in their intellectual property by customizing a FrameworkPascal compiler convertor to compile non Windows as well as legacy function based source code into Windows GUI event driven programs. Substantial savings can be achieved by eliminating the need to redesign, rewrite and test Windows event driven programs. Intellectual property written for other systems including real and protected mode DOS, SUN, Apple MAC, Unix, Mainframes and database operating systems can have full access to the Windows GUI, API, controls, Direct X and the Internet. The compiler provides a simpler function-based alternative to the Windows API and can extend legacy source code with native Windows programs and DLL's as well as cloud computing tools, SQL, database and OLE with proportional font and graphical user interface. FrameworkPascal 6.1 transparently compiles legacy Turbo Pascal DOS style programs source code into Windows based GUI programs without the need for all of the complex steps required to develop a Windows GUI application. replacing TMT Pascal 5.00 and 6.00 personal & commercial versions. Build 32-bit applications easily with the FrameworkPascal Compiler. 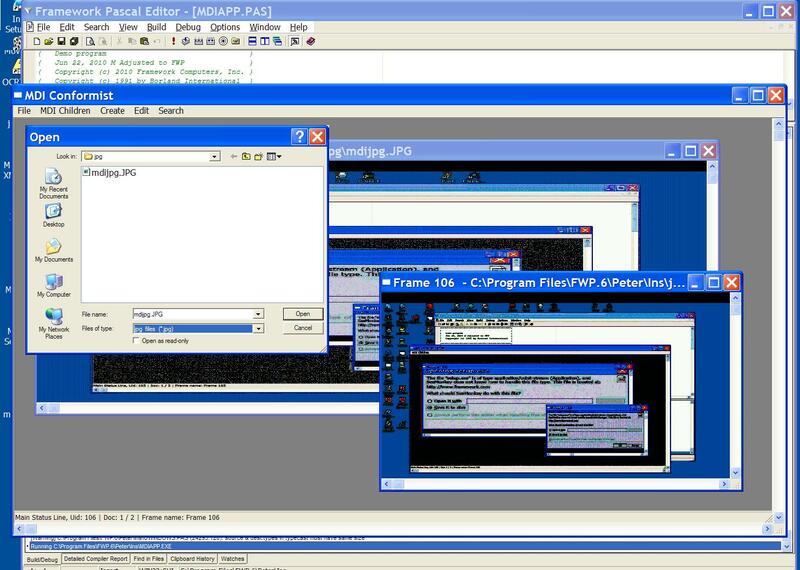 Transparently compile MS-DOS applications to Windows GUI. The easiest way to create Microsoft Windows GUI/DLL for Windows 10, as well as the early 95/98/Me / NT / 2000 / XP / 7 etc. GUI applications. Use the FrameworkPascal Compiler Multi-Target Edition to recompile legacy Turbo Pascal's sources into 32-bit Windows, Windows Console and Extended DOS 32 bit applications without modifications. Have no speed limit on CPU for all the supported compilation targets. The FrameworkPascal compiler is equipped with a rich set of run-time library units which allow one to use Silicon Graphic OpenGL and Microsoft DirectX. These low-level application programming interfaces (APIs) are intended for creating games and other high-performance multimedia applications. They include support for two-dimensional (2-D) and three-dimensional (3-D) graphics, sound effects and music, input devices, etc. You will find some OpenGL and DirectX examples at our Code Samples page. The SciTech Multi-platform Graphics Library is included in the FrameworkPascal compiler. Using this library, you can create interactive graphics applications in the shortest amount of time. SciTech MGL has been used in the development of many leading titles like WinQuake™, Hexen II™ and many others. Learn more about SciTech MGL. FrameworkPascal is equipped with a powerful graphic library unit that uses the VESA/VBE 2.0 specification (including LFB support) for MS-DOS and Microsoft DirectDraw features for Windows applications. This library allows you to produce the fastest graphic applications for MS-DOS (32-bit protected mode) and Windows 32-bit Operating Systems. It is as compatible with the Borland Pascal's Graph unit as possible. It's unbelievable, but now you can now recompile your old Pascal sources as modern 32-bit MS-DOS or Win32 GUI applications. In most cases you do not need to make any changes in your sources to turn them into native Win32 DirectX executables. Graphic applications written in Pascal have never been so fast and powerful. FrameworkPascal's built-in assembler supports the newer Intel(tm) MMX (MultiMedia eXtensions) technology, which is supported by newer Pentium, Pentium II and Pentium III CPUs. This technology is intended to accelerate graphic and Multimedia applications. Try our compiler to create your own MMX optimized applications. Learn more about MMX technology.